Such was his impact, supporters even renamed the club in his honour by coining the nickname 'Liddellpool'. The winger came to prominence amid the gloom of the 1950s when relegation from the top flight and humiliating cup exits meant the Kop had little to smile about. The one shining light was William Beveridge Liddell, a player whose name to this day evokes dewy-eyed reminisces of a bygone football age. During a barren era which commands little coverage in Liverpool history books, the Scot ensured crowds continued to flock to Anfield in their thousands and was largely responsible for keeping the club's head above the abyss of Football League oblivion. Although his modesty would never have allowed him to admit it, without Liddell the Reds could well have sunk into the murky depths of the old Third Division. And if they had, who's to say they'd ever have escaped? Who, when the 17-year-old arrived on Merseyside back in 1938, imagined the club would one day owe him such a debt? It is Manchester United legend Matt Busby, at the time Liverpool captain, who the Reds have to thank for tipping off scout Johnny Dougary about a precocious youngster plying his trade for Lochgelly Violet. Here was a thrilling, skilful, two-footed winger - fast, direct and capable of bursting the back of any opposition net with one of his trademark thunderbolts. Liddell's fame soon spread far beyond the boundaries of Merseyside, even if a quick glance at his medal collection does not make for impressive reading. A solitary league championship, won in 1946-47, was scant reward to the talent he possessed. But the fact he was twice selected to represent Great Britain during the course of his career - a feat matched only by the legendary Stanley Mathews - is ample proof, if needed, of his immense stature in the game. Like all players of his generation, the outbreak of war proved restrictive but, having scored on his Liverpool debut in a wartime fixture, he was ready to take a place in the first team when league football resumed. The flying Scotsman's league debut was a memorable affair, a 7-4 thriller at home to Chelsea in which he scored two, one direct from a corner. It was the start of a campaign that was to see Liverpool crowned the first post-war champions. Unfortunately, George Kay's team failed to build on that success but Liddell's performances continued to be of the highest standard. In 1950 he inspired the Reds to their first Wembley FA Cup final, but on a grey day in the capital the Kop's star man was infamously kicked off the park as Arsenal ran out 2-0 winners. The following year, King Billy of Anfield almost became one of the British game's first exports when he was offered £2,000 to go and ply his trade in Colombia. It was a tempting proposition and one he seriously considered but, given the tender age of his twin sons, the Scottish international politely declined, much to the relief of his adoring fans around Stanley Park. On the pitch, Liverpool was a club in decline, and in 1954 the unthinkable occurred when the Reds suffered the indignity of relegation to the Second Division. Many players of his ability would have jumped ship but Liddell's unswerving loyalty ensured he stayed to help rebuild. A player of great versatility, Liddell filled every outfield position at one time or another but excelled most in an attacking role. A move from inside to centre forward resulted in him notching a career-best 33 goals in 1955-56 - a tally which would have been 34 had referee Mervyn Jones not controversially disallowed his late, late equaliser in an infamous FA Cup replay defeat against Manchester City. Ever the gentleman, Liddell - an accountant by trade - didn't complain. During the course of his illustrious career he was never booked and captained the club with distinction. One of the finest role models ever to play the game, he was the perfect club ambassador: a devout Christian who never drank, smoked or swore, he did a lot of work for charity, helped out at local boys' clubs and was a qualified Justice of the Peace. But while he kept on banging in goals, promotion continued to agonisingly elude Liverpool. In November 1957, Liddell achieved a major milestone when he surpassed Elisha Scott's all-time appearance record for the Reds. However, the following season he missed his first FA Cup tie for the club when he was dropped for the humiliating third-round defeat at non-league Worcester City - and it signalled the beginning of the end for the ageing Liddell. 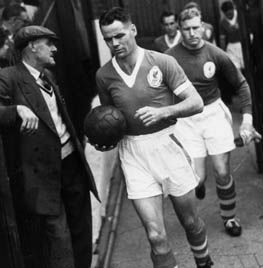 His popularity remained as strong as ever with the fans, who campaigned for his recall, but on August 31, 1960, Billy Liddell represented the Reds' first team for the final time. It was his 537th appearance for the club - a record that remained until Ian Callaghan's 18-year stint in the 1960s and '70s. When the forward's loyalty to the club was rewarded with a well-deserved testimonial, a crowd of almost 40,000 turned up to pay homage to a player who is still held in the highest regard. It was an unfortunate fact of life that Liddell's prime did not coincide with the Shankly revolution that followed. Had it done, who knows what he'd have gone on to achieve? The great man is sadly no longer with us having passed away with Alzheimer's, but visit Anfield on a quiet day and old-timers will swear they can still hear the once famous roar of 'give it to Billy' ringing around the Kop. Gone but never forgotten.